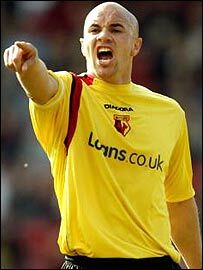 Watford captain Gavin Mahon says if the Hornets win promotion it will be largely down to boss Adrian Boothroyd. Boothroyd has led Watford into the Championship play-off semi-finals and Mahon believes he has transformed the club since taking over in March last year. Mahon told BBC Sport: "The only person who believed we could achieve something special this season was the gaffer. "He's the best I've played under. He's a good coach and his man-management skills are top drawer as well." Mahon added: "He was trying to get it through to us in pre-season that we could do well. "The way he is around the ground and the training ground is important to us, he believes in his own ability but even more so in the players he has got. "He will get across to the players how important they are to the team and that gives the individual a lift." Watford face Crystal Palace over two legs to see who will meet either Leeds or Preston in the play-off final on 21 May. And Mahon says there are fewer prizes bigger than the one that awaits the winner of that Cardiff showpiece. "As a professional footballer you want to play in the big games and they don't come much bigger than this, getting the chance to play in the top division," said Mahon. "These are the most important games in our recent history. "We have been to an FA Cup semi-final and a League Cup one too, but every supporter and player wants to be involved in the Premiership." Mahon thought he might be forced out of Vicarage Road when Boothroyd arrived just over a year ago but now the two men stand on the brink of an astonishing fairytale. "There were a lot of players going at the end of last season and, to be fair, I thought I might be one of them," he revealed. "But the gaffer pulled me into his office and told me he wanted me to be his club captain and to take the club to where he wanted to get them, which is what I've done so far. "But I'm not thinking about the Premiership, just the next 180 minutes of football. "We're all looking forward to it and the fans will have a massive part to play as they have all season, so bring it on."